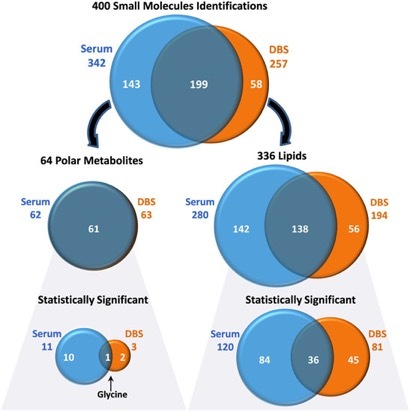 Venn diagrams illustrate the number of serum and DBS small molecule identifications and the overlap between the sample types. The small molecules were separated into polar metabolite and lipid identifications and into those statistically significant among the patient groups. Enlarge Image. Longitudinal studies of disease require collecting biofluids, preferentially blood. But getting serum blood samples takes the work of a professional, and storing thousands of such samples at -80 degrees C means using a lot of energy and freezer space. These limitations make dried blood spots (DBS) of great interest to researchers. They can be collected non-invasively in remote locations by non-professionals, transported cheaply, and can be stored at room temperature in comparatively limited space. Given the many advantages, the question is: Are DBS useful in longitudinal studies that follow metabolic disease? A new paper led by researchers at the Pacific Northwest National Laboratory (PNNL) compares DBS to serum samples. We now better understand the limitations of DBS samples. (Serum samples are needed for longitudinal studies of polar metabolites if DBS samples are stored at room temperature.) And we now know that DBS samples are adequate for assessing changes in lipids. The paper, by lead authors Jennifer E. Kyle and Erin S. Baker of PNNL, compares the efficacy of serum samples to DBS by analyzing overlapping polar metabolites (64) and lipids (336) from case-control samples collected in 2000-2001. They used triplicate samples from older male patients with high Body Mass Index, triglycerides, and glucose levels and low HDL (high density lipoprotein), comparing them to a control group made up of older males with normal levels. The DBS were stored at room temperature after collection and compared to matched serum samples stored at -80C. Mass spectrometry was used to identify 400 lipids and polar metabolites. The lipids and metabolites from the DBS were compared to those in serum samples to determine if molecular degradation occurred over time and if the disease signature was preserved in the patient group. The findings support evidence that lipids can be analyzed in older DBS samples and can provide important information in longitudinal studies. Future analyses are needed to address questions related to polar metabolites and lipids in fresh DBS and serum samples, and in DBS samples that have been stored at cooler temperatures for long periods of time. Sponsors: This work was supported by the Laboratory Directed Research and Development program at the Pacific Northwest National Laboratory (PNNL), the National Institute of Environmental Health Sciences of the National Institutes of Health (NIH), the NIH Eunice Kennedy Shriver National Institute of Child Health and Human Development, and the National Institute of General Medical Sciences. Research Team: Jennifer E. Kyle, Cameron P. Casey, Kelly G. Stratton, Erika M. Zink, Young-Mo Kim, Xueyun Zheng, Matthew E. Monroe, Karl K. Weitz, Kent J. Bloodworth, Daniel J. Orton, Yehia M. Ibrahim, Ronald J. Moore, Richard D. Smith, Kristin E. Burnham-Johnson, and Erin S. Baker (PNNL). Christine G. Lee, Catherine Pederson, and Eric Orwoll (Oregon Health and Science University). Reference: Kyle JE, CP Casey, KG Stratton, EM Zink, Y-M Kim, X Zheng. ME Monroe, KK Weitz, KJ Bloodsworth, DJ Orton, YM Ibrahim, RJ Moore, CG Lee, C Pedersen, E Orwoll, RD Smith, KE Burnum-Johnson, ES Baker.2017. "Comparing identified and statistically significant lipids and polar metabolites in 15-year old serum and dried blood spot samples for longitudinal studies." Rapid Commun. Mass Spectrom. 31: 447-456. DOI: 10.1002/rcm.7808.